The first day of spring was last week but we are far from that I fear. You all may already have daffodils popping up and maybe even cut the grass but here, in Jackman, we are still covered in white. This past weekend we had riders and ice fisherman that all had a wonderful time. The days warmed up so late in the day, the trails became a bit soft but the night went back down to the teens. Our ice fisherman all came back with a nice sun kissed glow to their faces. It was beautiful all weekend with blue skies. SO far this week, we are hitting the high forties but I just do not see the white going away yet, well at least not our piles. Think SPRING! I cannot say this this is a trail update as I think I only posted one trail report to the blog this season. It has been a crazy winter. More cold then snow. Last weekend seems like it was the best storm we had for the trails. Needless to say, this weekend will probably be the last and best of the whole season. We have a solid base, the snow we did get last week gave the groomers something to work with. And the temperatures….really cold at night. The trails are flat and firm and fast. Don’t forget ice fishing. We have at least 3 feet of ice out on Big Wood. Wonder if they will extend the ice fishing season in our region this year? 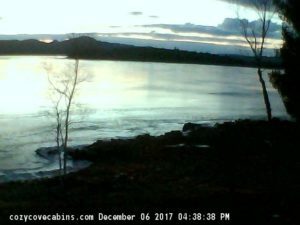 Here is a snapshot from our Webcam this evening. Big Wood is setting up for the 2018 ice fishing season. There is a nice glaze of ice over the pond today even with all the rain we had last night and temperatures today in the 30s. We have had some really cold temperatures this past week and lower chill factors. The lake actually glazed over a couple times, then the wind broke it up. So we were quite surprised to see the glaze today. YEAH!! Personally, I think our fisherman do best in January so make your reservation soon as our lakeside camps are filling up. As a reminder though, February 18 and 19 is free fishing days. This years snowmobile season has come to an end. Surprisingly, we had riders here last weekend (April 7th) and even though they chose to trailer up to the clubhouse, they said the ride to Pittston was really good. The trails in our region remain open until April 15th but our club is no longer grooming. The temperatures have warmed up considerably this week. The snow is melting and we can even see the ice on Big Wood rising with all the run off. A big thank you goes out to those of you who stayed with us this winter not only to snowmobile and ice fish but also those who just needed to get away, See you next season….unless you want to visit us this summer! Although the Border Riders Club have not opened the trails yet, there are people out riding. Plenty of snow on unplowed roads and in the higher elevations. I was told there is over 20 inches of that white stuff after this last storm. It was very fluffy snow so getting it packed on the trails is going to take a bit of time. The groomers have started working their magic. Our trail master said trails could be ready by this weekend. There is ice on the lake but we are not sure how thick yet. I did see snowmobile tracks along our shoreline this morning. So it is looking to be a good start to the 2017 winter season. We will update you all as we know more either here or on our Facebook page. Call us soon. This past week, winter in Jackman Maine has arrived. Our night time temperatures have been below 20 degrees. This is not only helping the snow we are getting already to stay but providing us with a good base. We even had a skim of ice on Big Wood the other day but then the wind picked up and it broke up. But the water temperature was down to 38 and dropping daily. Soon we will see a solid frozen lake from our cabins. 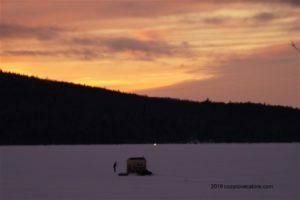 The 2008 ice fishing season has begun and Big Wood Lake has come alive with sledders or ATV pulling their gear in hopes of getting their catch of the day….